Although I can get the 0-coast to sync to midi clock, it does not seem to go faster than a tick per beat. Is there any ways to make it go faster ? Generally dividing clock rate is easy while multiplying is innacurate so I'd be nice to get a signal as close as possible to the original midi pulses. Here's my previous video. Nothing fancy sounding but a funny idea. I've done something similar with the EXH "8-Step"
here's a little clip of some noodling on the 0-coast with a little analog delay. I've spent dozens of hours with this beast so far and I LOVE IT. My first venture into modular/semi-modular and now i'm hooked. Started my synth journey with a minilogue and a few volcas, but a friend of mines modular setup really inspired me to dig deeper. I'm a total synth noob. My primary musical experience is playing drums in rock bands so synthesizers finally have me wanting to learn more about music theory and electronic music, and the 0-coast is keeping me inspired. Can't wait to check out the wealth of knowledge here and start building a rack setup of my own. Has anyone worked out how to set different clock divisions yet? The manual states that CC116 can alter the clock division but I can't get it to work. I've had no problem setting clock divisions using the max4live device (http://www.makenoisemusic.com/manuals/0-coast_programmer_m4l.zip). Make sure you're in the midi pages when you change it, and then exit by holding down program b to save. Thanks for the link but I don't have Ableton or max4live. Has anyone managed this without max4live? Hey there ! Ever tought about adding a Touchplate Keyboard to your 0-Coast for some "Music Easel" type action ? Well we tried and it's fun ! I don't think there is, but I wanted to see if anyone has figured it out. Mix in the slope signal with the random using the Voltage Math knob and adjust rise and fall ofthe slope to go on with the random speed as you like. Exploring additional 0-coast oscillators. Sequenced and modulated by Digitakt. Random out to contour gate in. Sustain to maximum. Onset, decay and curve to taste. Contour out to whatever you want to control. Your random is now slewed. I thought Gate was just on/off... So how does the random levels get translated into different voltages if the gate in is just taking 1/0? I'd have guess that this patch would just sweep a fixed voltage based on sustain level. But I actually hear the random tones. So does that mean that Gate in is actually voltage sensitive, or is there some other "magic" going on I'm not grokking? Yes it just means the Contour might be based on a DUSG type design more than on a regular gate only sensitive envelope. Woah, is this true? Can someone confirm with scope shots? I tried your patch out, and it seems that the maximum Sustain level of the Contour circuit is determined by the level of the voltage that is gating it... so you could also think of the Sustain control as kind of an attenuator, while the Onset and Decay controls are like slew limiters in the up and down directions respectively. However, I found that it does not pass tuned voltage very accurately (you can't use it to add slew to a melodic sequence without that sequence being knocked out of tune). Nonetheless this is a fun use of the Contour circuit and should open up some new possibilities in your patching! Contour's gate input is unipolar, so with onset and decay set to zero it acts as a half wave rectifier with attenuation via the sustain knob. I've also managed to get it to work as a kind of envelope follower by feeding it external audio, but it's not exactly snappy or precise. Hey all... Not sure if this "deserves" it's own thread or not, so I'll put it here for now. I've created a little layout for the iOS app MIDI Designer Pro to access all the midi/CC related features of the 0-Coast. I've created a Reaktor 6 ensemble for editing the program pages. This is great, thanks for making this! As a Reaktor user this will come in very handy! are you using CC, NRPN or SysEx messages on this? It's using CC messages, the ones that are in the table on page 15 of the manual. 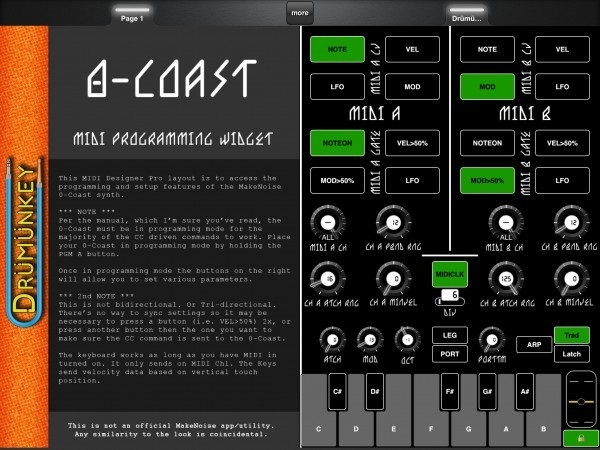 Hope it's useful for every reaktor user who also owns a 0-coast. I've had my 0-coast a week now and so much fun. Couple of thing that feel like bugs though relating to the arp. Oh and yep I've read the manual and every forum post I could find! I'm controlling the 0-coast with my Octatrack and trying to send gate via Midi B by patching to the tempo in to control the arp speed. Looking at the tempo indicator window the OC is receiving the gate. As soon as I engaged the arp the tempo indicator freezes on and arp stops sounding. Or if the arp is running and then I patch midi B gate to the tempo in the same freeze. Perhaps I'm missing something really obvious!? I have been able to use Midi B gate to fire the contour no problem and also able to use LFO from Midi B to drive the tempo in - just the gate that doesn't seem to work. Oh and perhaps a related issue the Latch Mode of the arp doesn't seem to work as expected. Notes latch on, but notes aren't released if I press them a second time (as the manual says).